This week picked up exactly where the episode two weeks ago left off. Hunter took a chance to attack Ward, despite potentially getting Andrew killed, but Ward still got away. Luckily, Andrew managed to survive the assault by Strucker and his goons, thanks to Coulson sending an agent to keep an eye on Andrew. May is furious at Hunter, who insists he made the logical choice, and she takes him off the assignment to find Ward, confirming to Coulson that she’s 100% back with the team (complete with the requisite badass hero shot to emphasize the point). Daisy is also back from her ordeal with the ATCU and Lash, and she has a new theory that Lash is actually working from inside the ATCU, since he seems to have intel on their movements. Coulson’s set to finally get that tour of the ATCU’s facilities with Rosalind, but he wants Daisy to keep investigating her theory in secret. Let’s set May’s hunt for Ward aside for the moment and follow Coulson and Daisy. Coulson is picked up on a street corner by Rosalind, and the two give each other a bit of a hard time for not divulging more of their secrets. The trip to the ATCU is put on hold when Rosalind gets a call about an emergency at home, and Coulson insists on tagging along and waiting for his tour. There was apparently a break-in at Rosalind’s home, and as she and agents search the house Coulson plays Sherlock Holmes, deducing what he can from her living room. He takes note of the brand new furniture, the rare autographed baseball bat, and when Rosalind returns later with burgers from Coulson’s favorite restaurant he knows she’s stalling him. He confronts her and she admits that she doesn’t want to show him the ATCU, but relents and they finally head for her base. Daisy, meanwhile, wonders to Andrew why Lash spared her but killed the other Inhuman. But Andrew is more concerned about Lincoln, wondering where he is and why he won’t come in. Daisy’s investigation convinces her that Banks, Rosalind’s right-hand man, is Lash, and she and Mack decide to tail him, with Hunter tagging along because no one else will let him play with them. They follow him to his home, and as they debate ways to keep him from going inside and ending their investigation for the day Hunter just walks over to Banks and ICEs him, dragging his body into the van. Hunter says they can test for Inhuman markers in his blood but they don’t have any equipment for taking a sample so Hunter breaks his nose, clearly struggling with his anger issues. Daisy calls Simmons, who returns back to the lab to run an analysis on Banks’ blood, but it comes up negative, he is neither inhuman nor Lash. But Banks’ phone gets a message that leads them to Endotech, so they dump him back in his car and follow this new lead. At Endotech, an obvious front for the ATCU, Daisy unleashes a new prototype dwarf designed by Fitz, which they send inside for surveillance and which can conveniently cloak itself. They watch as an Inhuman is unloaded from a truck trapped in stasis inside a clear cube, and is sent into the building for storage. Even more alarming, at least to Daisy, is that Coulson is there calmly watching with Rosalind, rather than freaking out and trying to stop them. He may look calm, but Coulson tells Rosalind that it looks like a horror movie. She explains that they’re working on a cure to the Inhuman problem, and they’re keeping those they find safe until the cure is ready. They’re a danger to themselves and others, she says, and equates it with a medically induced coma. Coulson then starts to see through the cracks in her façade and gets her to open up about her past, about losing her husband to cancer and wishing she could have done the same for him. May, meanwhile, is on a mission, and she can’t do it alone. She confronts Bobbi in the workout room, attacking her for letting Hunter go after Ward, saying that Bobbi egged him on and is responsible for what happened to Andrew. 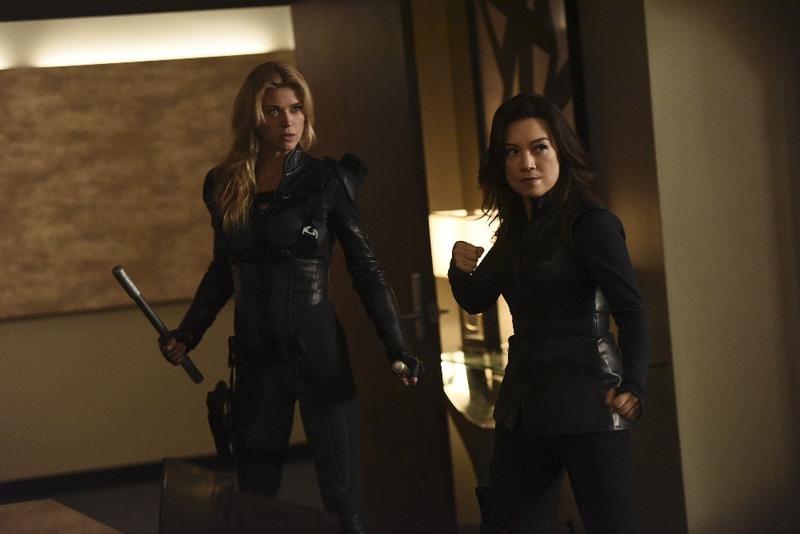 Bobbi fights back, besting May and passing May’s test by proving that she’s ready for a mission despite what Coulson might say about her lungs. They refuse to let Hunter tag along (leaving him to mope around the Playground and eventually team up with Daisy and Mack), and on Zephyr One (the new Bus) May and Bobbi follow the trail which begins and ends with Zucker. There’s some shock once they realize his identity, but they trace him using one of his accounts in the Cayman Islands, their next stop. Ward, meanwhile, is recuperating in another HYDRA warehouse, and sends Kebo to find Strucker. But Strucker has hooked up with an old ally of his father’s, played by Powers Boothe presumably reprising his role as a member of the World Security Council (and HYDRA agent, I guess) from The Avengers. This unnamed man calls Ward and Ward’s reaction makes it clear he knows who he’s talking to. The man was the one of whom all of the other HYDRA heads were afraid, but Ward isn’t interested in the redemption that he offers. Surprisingly the man offers up Strucker’s location to Ward, for apparently no other reason than to make it clear that he’s choosing a side in this war. At the bank in the Caymans, Bobbi poses as an interpreter for May, allowing the two to talk secretly in Chinese while they use IDs forged by Fitz to access the safe deposit boxes. They blow all of the locks on the boxes and find Strucker’s, which has various passports and other papers inside. May and Bobbi are then confronted by the bank’s manager and two guards, and they discuss in Chinese how to deal with the situation. I’d love to tell you what they said to each other, but at this point my local ABC station decided to post election results on the bottom of the screen covering the subtitles, despite the fact that they still had 0% of the precincts actually reporting votes! (Thankfully my good friend and coworker Kelly took screenshots when she watched it online later and sent me the subtitled conversation.) Bobbi tries to talk their way out of the situation, claiming that they tripped the alarm on purpose as part of a security test, but it doesn’t work and they’re forced to knock out the guards and the manager and make a run for it. Back on Zephyr One May questions Bobbi on whether she’s still hiding behind her medical tests, rather than letting her torture at the hands of Ward make her stronger thanks to gained experience. Fitz manages to trace Strucker to Portugal, and Bobbi and May break in to find Kebo torturing him. Kebo stabs Strucker and makes a break for it and Bobbi goes after him while May deals with the other HYDRA goons guarding Strucker. Bobbi and Kebo face off outside, with Kebo getting the upper hand and disarming Bobbi of her staffs and tossing her in the pool. He holds her under the water, but she manages grab a staff and break free, climbing out of the pool and using her staff to electrocute Kebo, leaving his status uncertain. May, meanwhile, makes fast work of the HYDRA soldiers and interrogates a dying Strucker on Ward’s whereabouts. Strucker, however, confesses that he tried to kill Andrew but “didn’t know he turned into that thing.” We watch as Andrew’s attack unfolds differently than he told to Coulson, with Andrew transforming into Lash and killing the remaining HYDRA thugs before setting the building on fire as Strucker ran. “What is he?” he asks May. “I don’t know,” is her only response. So Andrew is Lash, and my instincts were right for once! I thought for sure during this episode it was a red herring, but they played the clues straight. Andrew’s interest in the Inhumans this season takes on a new slant in light of this discovery, though we still don’t know his agenda. He hasn’t hurt Daisy, and as far as we know hasn’t messed with Joey Gutierrez, but he seems destined to kill all of the other Inhumans, and is particularly interested in Lincoln at the moment. Does he think he’s working for SHIELD in some twisted way, or perhaps protecting SHIELD? Or is he just biding his time and using SHIELD and will turn on them when it comes time to take out Daisy? And how will May handle this latest development? Will she keep it a secret? Try to confront him? Push the panic button and tell Coulson right away? After last week’s episode it made sense that we’d get less Simmons this week, but she still had a couple important scenes. I really enjoyed watching her turn the tables on Andrew and analyze him for a change, particularly the pair relating over being stronger than people think (“maybe it’s our PhDs”), though I don’t think Simmons and Andrew were thinking of the same thing there. Later she and Fitz talked briefly about what we learned last week. Fitz is still studying the portal, despite Hunter warning him not to go down that road, and is determined to bring Will home. Simmons is worried that he doesn’t want to help, but his silence has just been because he hasn’t found a solution and doesn’t want to disappoint her. They both admit it’s an odd situation, but she takes his hand when he reassures her that they’ll find a way to bring Will home. That doesn’t mean, however, that Fitz won’t google the hell out of Will once Simmons leaves the room. We had a lot of our characters changing their roles tonight. May is back in the fold full time, taking the lead on hunting down Ward after being reluctantly dragged into the fight by Hunter. Whether she’ll stay on his trail after the news about Andrew is another matter, but it’s good to see Coulson’s right hand back for good. Bobbi is back in the field, and probably would not have been so gun shy had May not kept pushing her on it. Still, May is trying to push her through any lingering self-doubt or fear, and it’s good to see Bobbi back in the fight even if the show didn’t make as much dramatically of her injured status as they could have. Change is better than stagnation, even if it means a few missed opportunities for storytelling. And it was hilarious to see Hunter sidelined and annoying the crap out of everyone. I half expected Fitz to zap him with some gadget just to get him to go away. But his impulsiveness and violence are going to get him or the team into even bigger trouble than he has so far if he doesn’t find a way to reign things in. You can’t shoot all of your problems, even if it’s fun to break the nose of a jerk every now and then. I definitely don’t trust Rosalind at all, but I can’t deny that she and Coulson have a solid chemistry. Part of that is simply great acting from Clark Gregg and Constance Zimmer, but they’re also just so well matched. They have a similar tone when dealing with outsiders, a sort of snarky, sarcastic way of confronting challenges, but I can’t imagine Rosalind relating to her people the way Papa Coulson watches over his team. It helps that they’re pretty much equals both in terms of position and responsibilities. I don’t necessarily want a romance between the pair (bring back Audrey the cellist! ), but it’s fun seeing them build a connection and play off each other. But at this point I’m more curious about what Rosalind is really doing with the Inhumans she’s captured. “Curing” them sounds a little too nice, especially if the cure isn’t voluntary. What do you think? Did you enjoy “Among Us Hide…”? Were you surprised that Andrew is Lash? What do you think he’s up to? How will May handle the situation? What are Rosalind and the ATCU really up to? Will FitzSimmons find a way to rescue Will? Is there more to him than meets the eye? What are Powers Boothe’s character’s motivations? What is he after? Was he a part of HYDRA the whole time? Is Kebo dead? What is Ward planning? Will Lincoln and Daisy ever get together, and do you want them to? What do you want to see from the rest of this first half of season 3 before the winter break? Let me know in the comments! This entry was posted in SHIELD Recap and tagged Agents of S.H.I.E.L.D., Agents of SHIELD, among us hide..., AOS, bobbi morse, coulson, Daisy Johnson, fitz, FitzSimmons, Grant Ward, Inhumans, Jemma Simmons, Lance Hunter, lash, Leo Fitz, Lincoln, maos, Marvel's Agents of S.H.I.E.L.D., Marvel's Agents of SHIELD, Melinda May, Phil Coulson, S.H.I.E.L.D., SHIELD, SHIELD reaction, SHIELD Recap, simmons, Skye by lovepirate77. Bookmark the permalink. I was way surprised that the Andrew is Lash theory was true as well. The only other time I was right about something was Skye being Daisy Johnson, and that was after 2.09 where it became more obvious. Although it is a little heartbreaking, I find this storyline more interesting considering we’ll definitely have to explore this development. When did he become Lash? Why does he want to kill Inhumans? Why did he spare Daisy? Some people believe that he spared Daisy because he still needs to find Lincoln, but that seems like it’s selling her way too short as the lead of the show. After remembering Andrew’s line about how “they’re all so different” I think it may have to do with deeper implications, much like how Lash from the comics spared Inhumans he deemed worthy of their abilities. Of course I believe Daisy’s worthy of her abilities, but they’ll probably have a different answer to tie into his actions. Such as the one with Rosalind who’s keeping Inhumans locked up until they’re “cured.” Of course, she never really mentioned if every single one of those Inhumans wanted to be locked up, so we have to take her actions with a grain of salt. It could reflect Andrew/Lash’s mindset in what is their worth to the world if they can’t control their powers or harm themselves/others. While Lash’s methods of outright murdering them are harsh, Rosalind’s aren’t that better. I think it still shows that the ATCU aren’t bad in general, but they do need to have more openness to different ways. They could be an interesting parallel if it goes that way. All I know is I don’t want anyone near Andrew at this point. I had to sit through sputtery freezing commercials online, and reboot the whole mess twice, but at least they didn’t axe the subtitles on the May Bobbi conversation. I’m quite fond of the interplay between Coulson and Rosalind. I’m seeing her organization as a (somewhat misguided) alternative answer to the issues of the Inhumans. Very reflective of what goes on in the real world (oh, saaaaaaay, Republicans vs Democrats, is one of them evil, perhaps… maybe… or not, maybe just a difference of opinions, some of which should be dropped off a very tall cliff). Perhaps a compromise will be reached, or Coulson will enable Rosalind to see the light. OK, what IS up with Lash? I want to know. Everyone seems to have a different answer to helping or controlling or eliminating Inhumans. Is there a connection between the Inhumans, that planet, and Will?